I am so out of it. I only realize today that it was around this time of the year that I took my first backpacking trip overseas. So what was I doing on May 21, 2006? Looking at my photo directory, it appears that it was the day I made my way from Ko Samui to Ko Phangan. Ah, yes, how could I forget? I had it planned out even before I left Manila: I read online that there is a boat that goes from Maenam beach in Ko Samui direct to Thong Nai Pan Noi in Ko Phangan. As luck would have it, those are the two places where I will be staying. On the morning of May 21, 2006, I had my delicious breakfast of vegetable fried rice at Moonhut Bungalow, enjoying the view from where I was seated. I liked staying at this resort, though I am also looking forward to going to a new place. Oh, I DID miss it. I ended up walking in the sand under the midday sun all the way to the Lomprayah dock (which is about 1 kilometer away), carrying my backpack. Not good. There was a travel agent office at the dock, and I asked the two lovely ladies when the next boat to Ko Phangan will leave. They said there’s no boat going there until 4pm, and it leaves from Bophut and docks at Hat Riin in Ko Phangan. Resigned, I just made reservations for this boat, and they told me somebody will be picking me up from their office. They were the nicest people I’ve met. They told me that I could leave my things in their office so I wouldn’t have to lug it around. Since it was lunch time, one of the ladies invited me to lunch, as she said she knows this nice place where the food is good and cheap. As with most Thais, she has her own scooter to help her get around. She told me to hop on the seat behind her, and for a second, I just stared at it. I’ve never learned to ride a bike, much less a motorcycle, and there I was getting on one. Over lunch, she talked about life in Thailand. Both she and her partner are from Bangkok and they plan on opening their own agency at Ko Phangan. She even gave me their card and told me to get in touch, whenever I go back to Thailand. They are amazed how I could travel alone and told me to be careful. I guess that’s one perk of being a solo female traveler; people often want to take care of you. We went back to their office and I waited for my ride to Bophut. It came around 2:30, just when I was dying of boredom. The ride to Bophut was a pretty short one, and left me with another hour or so of waiting. The boat finally came, and finally, I was on my way to Ko Pha Ngan. At Hat Riin, there’s a lot of people waiting, mostly drivers, hawking their destination. I walked on, hoping somebody would say “Thong Nai Pan Noi.” I finally see one, and was secretly glad it was a van, not a songthaew. Unfortunately, the van only goes halfway, then the driver switches vehicles to, yes, a songthaew. I’ve nothing against songthaew, but like the jeepney, it’s not that comfortable to ride in one, specially when going through rough terrain. 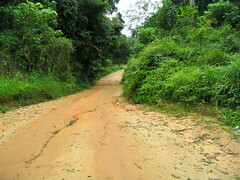 The road from Had Riin to Thong Nai Pan Noi is no joke. It’s paved at certain parts, and on most parts it’s just bare earth. Suffice to say, I was pretty tired and cranky when I finally walked into Baan Panburi. Nina, I’m writing here because I can’t find a contact email for you on the site. Maybe I’m stupid – anyway…I googled DVD Manila as I want to find somewhere in Manila that sells DVDs/VCDs like those massive cheap places in Bangkok but I’ve had no luck and I saw a post of yours that mentioned such a place. Was it on JP Rizal St in Makati? If you could find the time to shoot me a quick email with directions, I would be extremely grateful and would wish you much good karma. Hi Nina! Great site! Wish I could travel all over Asia and the rest of the world like you. You have a great blog! Take care!